fcardos 2 years, 2 months ago. – Here is How to Install TWRP through fastboot (this guide requires unlocked bootloader on Honor 4/4x). Download and Copy the GApps and Honor 4/4x (cherry) CM14/CyanogenMod 14 ROM ZIP to your phone. First flash the Honor 4/4x CM14 ROM ZIP from device. Then flash the Camera FIX zip from your device memory. Reboot and Enjoy the CyanogenMod 14 Nougat ROM on Honor 4/4x. 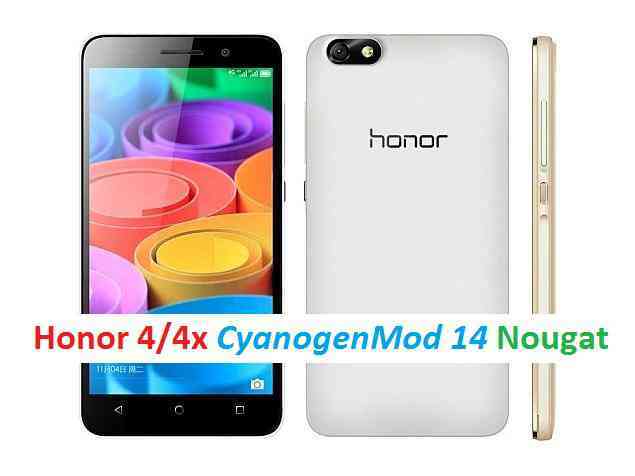 Copy the latest Honor 4/4x CyanogenMod 14 ROM ZIP file to your phone. Stay tuned or Subscribe to the Huawei Honor 4/4x (cherry) forum For other Android Nougat ROMs, CyanogenMod 14 ROMs, other ROMs and all other device specific topics. Thank you very much friend Nougat develop for our device. Test results performed on Huawei g620s-L03. * .- Not recognize sim card. * .- You can take photos. * .- You can not record videos. * .- Problems in battery performance. As I said, thank you for developing friend, I hope I can continue improving it and I am ready to help him try. I hope you can repair that the phone can not recognize sim card!!! thankyou very much!!! Can You tell me what model does it support?